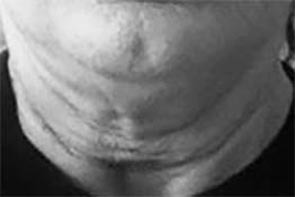 Getting rid of a sagging neck generally calls for more than Facial Resistance Training™ (building) the neck muscles. 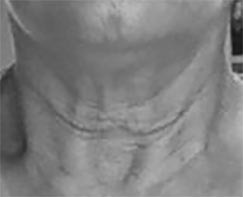 If bone loss is also a part of the problem (jawline shrinkage) FlexEffect offers an additional training technique that is paramount… See: Bone Remodeling. If not bone loss, then perhaps sun damage or simply worn out elastin in which case Skin Remodeling would be needed. Facialbuilding covers all the features of the face separately i.e. bone, muscle, and skin. 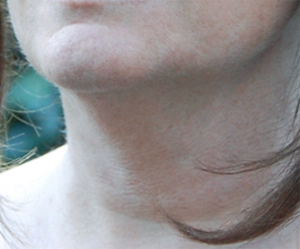 It is rare when a sagging neck can be corrected by simply targeting one feature. ABOVE Carol trained primarily with Resistance Training for several months. Not until she incorporated Cross Stretching™ was she able to make serious changes. She’s not finished yet but she’s sure on her way! Carol assured us her weight had nothing to do with the outcome. She said she wasn’t dieting and her weight remained the same. ABOVE Tori trained for one year. Visit her Before & After page… An amazing transformation!